Storage tanks can be found in a wide variety of locations and environments, from indoor or outdoor installations to above or below ground. Properly monitoring and managing levels inside these tanks can help improve efficiency and increase productivity and profitability. This article outlines the advantages of wireless tank level monitoring. There are a number of methods and tools that can be used to measure tank level. From visual inspections to floats to ultrasonic sensors, there are many technologies to choose from that vary in terms of accuracy, reliability and cost. Visual inspections and measuring sticks may be relatively inexpensive, but they are labour-intensive and prone to error because they rely on manual reporting methods. More accurate tools, like floats and submersible pressure transducers, are not dependent on human labour to measure levels, which can simplify processes and minimise the risk of error. However, in some applications, a non-contact solution is preferable in order to avoid contaminating the contents of the tank. In addition, prolonged contact with tank contents, for example in the case of viscous or caustic liquids, can degrade the performance and accuracy of these measurement tools. An ultrasonic sensor is a good choice for applications where a non-contact solution is needed. These sensors use sound waves to detect objects, so they do not need to come into contact with the materials they are measuring. They are immune to target colour, reflectivity, or transparency, and are unaffected by light conditions. 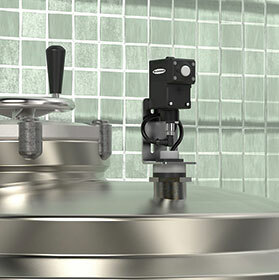 Ultrasonic sensors capable of a proportional analog output enable greater measurement accuracy and are a preferred choice for these applications. Wireless tank level monitoring can be a cost-effective solution and provide the real-time data and versatility to help businesses keep pace with change in the industry. Implementing a tank monitoring system that utilises ultrasonic sensors in a wireless network has many advantages. Wireless systems can be set up quickly, cost-effectively, and without large commitments of human labour or changes to infrastructure. They are capable of monitoring many containers and can adapt to meet changing needs and scale to accommodate new containers. Compared to wired technologies, connecting level measurement tools in a wireless network is far more cost-effective. The infrastructure changes required in a wireless system are minimal, and a wireless system is far easier to implement compared to a wired system. The system is then configured, and inspection parameters and alarm thresholds are set. A system like this can monitor many containers and can be set up in a fraction of the time and at a much lower cost than a wired network. With connected devices, asset managers can easily access tank level data in real-time, improving both efficiency and productivity. For example, with real-time monitoring of remote containers, managers can strategically plan visits based on actual need instead of sending staff to a site based on forecasted expectations of container levels. This saves time and costs while ensuring that tanks are full and processes are running smoothly. In addition, automated alerts can be set up to notify staff of potential issues, minimising the opportunities for emergency situations to develop. Business needs can change over time and companies may need to add or move containers at a site to keep up with new demands. Wireless networks are versatile, scalable, and adapt easily to changing requirements. Containers can be moved as often as needed without altering the system or disconnecting the measuring device, which means containers can be monitored even while in transit. New nodes from new containers can be integrated into the existing network, or a new network can be deployed to accommodate a new group of tanks without the time and labour commitments of altering a wired network. Implementing a tank monitoring system that utilises ultrasonic sensors in a wireless network has many advantages. Wireless systems can be set up quickly, cost effectively, and without large commitments of human labour or changes to infrastructure. They can monitor many containers and can adapt to meet changing needs and scale to include new containers. Automated alerts can be set up to notify staff of potential issues, minimising the opportunities for emergency situations to develop. The data generated by these systems is more accurate and can be accessed from anywhere and at any time. This allows managers to make more informed decisions about their assets, how they are used, when they should be serviced, and what staff and resources are needed to service them.